The PCM92 is as simple to operate as it is a pleasure to listen to. Just load a preset and the easy to use front panel keeps the most logical parameters within reach on the high-resolution display for adjustments and fine tuning. For in-depth sound design, you also have the capability to transition deeper into the algorithm and edit the full matrix of parameters. To supplement front panel navigation for live applications, the PCM92 can be configured and fully controlled remotely through Harman HiQnet System Architect™ from any PC. 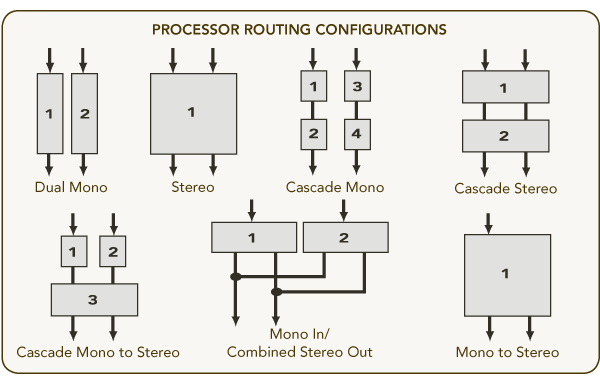 System Architect uses the Harman HiQnet protocol to configure and control the PCM92 seamlessly within a larger audio system that may consist of Harman Professional brands such as JBL®, Crown®, dbx® and AKG®. Also, foot pedal controllers make it easy to change presets and adjust parameters during live performances. The PCM92 can be controlled by either a two button momentary foot switch or a variable position foot pedal. The PCM92 can be divided into four virtual machines which allow the signal from each input to be routed through a variety of algorithm combinations.